Opened in 1933, the Museum of Science and Industry -- touted as the largest science museum in the Western Hemisphere -- is not only an excellent educational experience but a lot of fun for both kids and adults. Hyde Park Express (#2) south to 57th and Stony Island, Museum is 1 block east. Jackson Park Express (#6) south to 56th Street, Museum is 1 block south. Stony Island Express (#28) south to 56th and Hyde Park Blvd., Museum is 1 block south. The best bet on weekends or every day between Memorial Day and Labor Day, the Museum of Science and Industry bus (#10) runs straight to the Museum's front door. For more information and links to system maps, read my article on Chicago public transportation. Lake Shore Drive south to 57th Street. Turn right, and follow 57th around to the west side of the Museum. Turn left into parking garage. Parking is available in the museum's underground parking garage. Cost is $14 per vehicle. Monday - Saturday: 9:30 a.m. - 4:00 p.m., Sunday 11:00 a.m. - 4:00 p.m. The Museum of Science and Industry is open every day except Christmas Day (December 25). General Admission: Adults, $13; Seniors (ages 65+), $12; Children (ages 3-11), $9. Museum plus Omnimax Theater Admission: Adults, $20; Seniors, $19; Children, $14. U-505 Submarine On-Board Tour (requires general admission, not included): All Ages, $5. Built for $3 million in the 1930s, the Museum of Science and Industry opened as the first interactive museum in the North America. And that's what makes the Museum such a fun time. It's not about merely gazing at boring displays, but rather a hands-on approach to the learning experience. 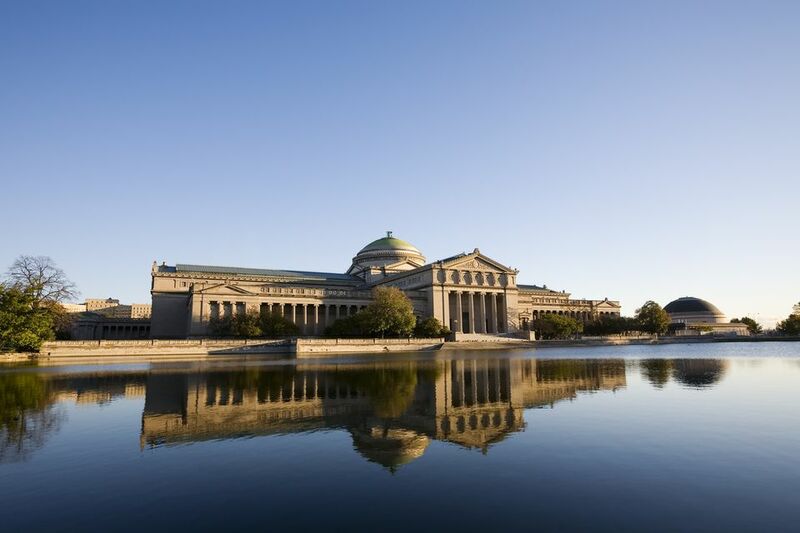 Whether it's hearing a mere whisper travel across a long hall or touring a genuine U-505 submarine, there are sensory experiences galore and puts the Museum of Science and Industry as one of my most recommended Chicago attractions. The Coal Mine The Coal Mine takes visitors 50 feet underground into a real mineshaft. Not recommended for the claustrophobic! U-505 Submarine This is a real German submarine, and the only one captured during World War II. Viewing a giant U-boat up close is quite a sight in and of itself; being able to tour the inside as well makes this a very unique experience. ToyMaker 3000 Very popular with the kids, this is a working toy factory manned by 12 robots. Omnimax Theater The Omnimax is a wrap around movie screen that stands 5 stories tall, enveloping the viewer and providing a sense of "virtual reality".